From a motorcycling perspective 2014 was a banner year for me. I rode over 17,000 miles on five different motorcycles. I know for some of you 17,000 miles isn’t a big year, but I don’t commute on the bike and I only did 1 overnight ride. All of the miles were in Texas, most of them in the Hill Country west of Austin. I thought I would share some observations on the bikes I rode throughout the year. I’m listing them in the order based on the least number of miles ridden to the most. I had wanted a Monster for some time. I almost bought a new 750 Monster in 1999. Back then the local dealer had one on the floor for a long time and had marked the price down to where I had a hard time ignoring it. Unfortunately he sold it the day before I stopped in with cash in hand to buy it. I’ve had test rides on different Monsters over the years. The last generation of air cooled Monsters just didn’t do it for me so I lost interest until the spring of 2014. I rode the new water-cooled 1200 Monster in April and really liked it. It felt a little bigger than the previous generations of Monsters, and, in my opinion, was the first decent looking naked water-cooled bike Ducati built. However, I really didn’t need that much bike so passed on the 1200. When Ducati announced the 821 Monster I put a deposit down on one and took possession of my 821 Dark in August. If you never ridden a Monster you need to. What a fun bike. It’s reasonably comfortable, faster than anything else I own and handles better than any motorcycle I have ever owned. Of course, we all expect a Ducati to be quick and to handle well. What I didn’t expect was the civilized riding behavior around town and the great fuel mileage – I seldom see it drop below 40 mpg and regularly see 45-47 mpg after a ride in the country. The Monster has 3 different engine maps but I find that I just leave it in sport. In my opinion Ducati has done a remarkable job of sorting out its ride by wire system. The only change I have made to the Monster are the handlebars. I put a set of Rizoma bars on my Monster, which gave me about an inch rise and a slightly more angular bend. I could have lived with the stock bars, but the extra inch is simply more comfortable. I will probably change the seat out sometime this year. I don’t know that I could live with the Monster as my only bike, but it will be around for a while as long as I can have at least two bikes. The Griso was my primary ride in 2013, having acquired it in December of 2012 with just 4,200 miles on it. I enjoy the Griso, but as one would expect it lost riding time to the newer bikes. My Griso is stock with the exception of the pipe and an ECU flash. The ergos work well for me so I don’t have any changes planned. I was surprised how few miles I put on the Griso this year as I enjoyed it every time I rode it. Unfortunately the Monster does everything the Griso does and does it better. The only edge the Griso has is comfort and I believe a new seat on the Ducati will fix that problem. Does this mean the Griso headed out the door? Not likely. The Griso is the ‘classic’ in my collection and is likely to hold that spot for a while. I still consider it one of the most beautiful bikes built this century. I bought the Bonneville new late in the summer of 2011 to replace a 2006 BMW K1200r that was just too fast for my own good. 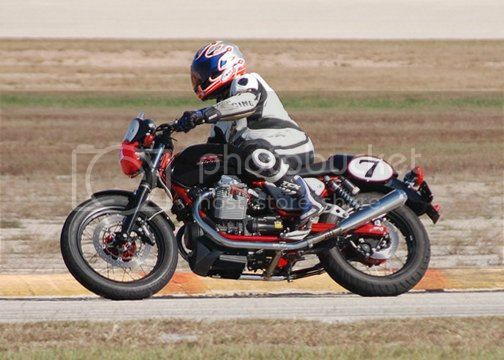 The Kr was one of those bikes that just begged to be ridden ultra legal speeds. Until recently I have said if I could only keep one bike it would be the Bonneville. The Bonnie is a pleasant, easy to ride, all around competent motorcycle. As most bikes built to a price point it needed modifications for comfort (shocks & seat) which I had made. What I found this year was the Bonnie just didn’t ‘speak to me’ anymore. I was surprised to find when I compiled the numbers that I had not ridden the Bonneville in September or October which are two of the prime riding months in Central Texas. Compared to the rest of the stable the Triumph is a bit boring. Don't get me wrong, it’s a great bike, but I suspect it will be moving on to a new home in 2015. The Sportster was definitely an impulse purchase. I was riding a 6 month old California and had a deposit down for a new Ducati. What in the world was I thinking about? Well, it was complicated, but a Sportster was another one of those bikes I had wanted for some time (almost bought one in 1990). Anyway, I had my eye on a used 2009 Sportster for a project I had planned. I just happened to stop at the local Harley dealer with a companion. They had this new Sportster marked down below what they wanted for most of their 2-3 year old used Sportsters, and, its was priced well below my estimated project cost related to the Sportster I was going to buy. So it followed me home. (More on the Harley experience later). People talk about ‘retro bikes’ – New Bonnevilles, the new CB1100, etc. The Sportster isn’t a retro bike, it’s the natural progression of the first Sportster Harley built in 1957. This was my first Harley in over 4 decades of riding. The Harley is the slowest, least comfortable and poorest handling bike in my stable. So why did it get so many miles this year? I’ll get to that, but first some comments on the bike. In my opinion Sportsters straight off the showroom floor are unrideable for any serious distance. As I’ve mentioned before I’m surprised that someone has not brought a class action suit against Harley because of the spine destroying suspension on the stock Sportster. I bet this is the main reason you see so many low mileage Sportsters for sale. Anyway, after new shocks, new fork springs and a new seat my Sportster was actually pleasant to ride. Why did I put so many miles on the Sportster? Well, it has character and was just plain fun to ride. I didn’t ride if fast or corner it hard but I rode it a lot. Once you have the suspension issue sorted the Sportster is an easy bike to ride. The Sportster doesn’t encourage you to ride fast or hard like the Monster or Griso do so I find I just flat enjoyed most of the rides I took on it. Having said that, there is a strong possibility the Sportster may join the Bonneville in finding a new home next year. I doubt if it surprises anyone who knows motorcycles that the big Cali got the most road time. It’s big, fast, comfortable and handles very well. I have put countless multi-hundred mile days on the Cali. It was always an interesting experience getting on the Cali after riding the Sportster. The speed, handling and comfort are in a different league than Harley. Actually the Cali’s level of comfort when out on the road is in a different league than any of the other bikes I have. My only issue with the Cali is the fact it’s a 700 pound bike. This is first bike I’ve ever owned that weighed over 600 pounds. The Cali is almost always my bike of choice when I plan a long ride. It did spend more time in the garage this year than normal because of tire issues. I waited for 6 weeks on a new OEM Dunlop front. I rode it sparingly during this time because I didn’t like how the wear pattern on the original front was affecting the handling. After 6 weeks I was told that it could be another month before I would see the front tire so we finally put a Dunlop Elite 3 on the front. This tire is intended to be a Goldwing replacement so there weren’t any load or ratings issue. However, the Elite 3 just plain feels different so I won’t be buying another. I do think the Cali will be in the stable for a while. I have a short list of changes planned for 2015. Of all my current bikes, the Cali would be the choice if I could only have one bike. I rode the most miles in August (2,464) and the fewest in January (905). I’m not surprised about January, but August did surprise me. August can be miserably hot in Texas. I guess I didn’t get as many miles during September and October because of business travel and football. I put the most miles on my California (7,094) and the fewest on my Griso (2,164). The most miles on the Cali wasn’t a surprise but the fewest on the Griso was. All five of my bikes are twins. Four are V-twins and one is a parallel twin. Two have pushrods and three have overhead cams. Two have drive chains, two shaft drives and one belt drive. One is water cooled and four are air cooled. Only two have ABS and traction control. Four have cast rims and one has spoked rims. All are fuel injected. I am realizing that I am a big fan of ABS, traction control, fuel injection, cast rims and non-chain drive, and, I can live with water cooling. Regarding the Harley experience: Going to a Harley dealer is more like going to a Chevrolet dealer than another motorcycle dealership. It seems to work for them because they sell a lot of bikes, but it’s not what I look for when I’m buying a bike. Harley riders seem to be in two camps. You have real bikers who seem to be more interested in the fact that you ride and ride a lot than what you ride. Then you have the lifestyle Harley riders that are primarily interested in form over function – having the right shirt, patch and chrome doodad on their bike. I never used to differentiate between the two, but they are distinctly different. I had several really interesting experiences this year. I went to my first MotoGP, I rode all 3 of the Twisted Sisters in the Texas Hill Country for the first time, I rode the Willow City Loop for the first time, I did two Texas Guzzi rallys, did my first Distinguished Gentlemen’s ride, went to my 5th Harvest Classic and attended the Revival Cycles 6th anniversary party. As much as I like classic bikes I doubt if I will ever own one. I’ve moved firmly from wrenching to riding so I look to have a reliable ride. The Griso is about as close to classic as I am going to get which is why I will probably keep it. And my final observation: What you ride is far less important than the fact that you do ride and you enjoy what you ride. I am grateful that I was offered so many riding options in 2014. Here’s wishing everyone a Happy 2015. Should we make this the thread?? I rode three bikes a total of about 5,600 miles. Lame I know but I have a 5 month riding season and I turned in my bike a month early. This was the only "horse in the stable" as it were until I bought my 1000SP right before the snow hit. It got all the rode duties from May until the end of August. I stopped in August because I had enough vaction time to ride to California from Alaska but not enough time to ride back. I left the bike with my parents so I can ride it back next summer. Like the V Strom. 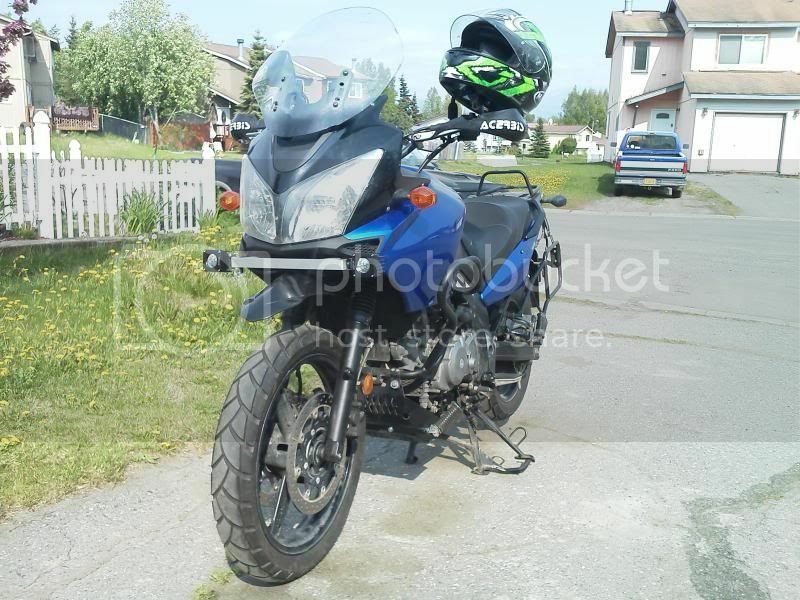 It is definitely a do whatever you need Adventure bike but I am ready for an upgrade. I have no real issues with it, other than maybe the seat (I have tried several options). Hopefully I can get some funds together and get a Stelvio in the next year or so. When I got home in August I helped my Dad transport some bikes so I got to ride his K1 about 20 miles. Very interesting ride. Fast, nimble for the weight and size, but terrible ergos. If it was comfortable like its K100 cousin I would have riden it back to AK. Once again I got to put about 20 miles on this taking it back to my Dads garage after the K1. Fun bike. Light handles fine and its an airhead. Hopefully the 1000SP in my garage gets some solid miles this year. I'm jealous of all the miles you got to ride. 17,000 is a great number. Even when I lived in California that would have been a good year for me. Good luck breaking that record in 2015. Good on ya for having the resources and time to put down those miles.......... I'm working on it. You are a personal inspiration: lots of great bikes, lots of twisty TX riding and the time to combine both. Stay safe, watch for the deer, and keep on going. ;-T Thanks for your reviews. Right now I am pondering two bikes: maybe three: the Ducati 821 Monster, the Ducati new Scrambler, and the Indian Scout. Of the three I think the Scout would be the most complementary to my V7R. Scouts are not yet in dealers, and I missed the test ride here in Houston last November. But, there is an Indian dealer just down the freeway. The 821 is in stock, but probably much more bike than I need, but then again? Love the Scrambler design mostly, but also not appearing in the dealer until next late Spring or so. A lot depends on finances: the oil crash may severely impact my career by mid-2015. I think the Griso will be with me for a while even if it doesn't get the most riding attention. There's something about the original silver block Grisos that really stands out in my mind. There have been many years where 5,600 miles would have been a big year for me. My riding goal for 2015 is to hit at least 1,000 miles every month. I can pretty much guarantee that if you get the 821 Monster your V7r will not get much riding time. A few tweaks can turn the 821 into a great all-round bike. For me all it really needed was a few ergo tweaks. I've thought about both the Ducati Scrambler (replacement for the Bonneville) and the Scout (replacement for the Sportster). I'd definitely test ride the Scout before I bought anything else. I suspect it may be a cut above most small cruisers at a pretty decent price point. Get out there an ride more in 2015. 2) and the hot pipe/poor foot movement issue. Local dealer has a red and a white in stock. Great to see you got some good riding in. Say a prayer to the G-ds of adhesion and all ways trust your cape! re the mirrors: I haven't yet, but I am looking at adding mirror extenders. re the heat: At times you will notice heat from the pipe, and on rare occasion sitting at the stop light. It's not enough to bother me but I'm sure some people don't like it. re foot position: not an issue for me. Let's figure out how we can get you some more miles in this year. Hey MJP, thanks for sharing your experience across a number of marques. I don’t have your experience on some of these machines and have probably fallen into a pattern of dismissing some due more to impression than reality. Your post has helped me to balance out some of my prejudice.